Fixed value resistors have a defined ohmic resistance and are not adjustable. Fixed resistors are the most commonly used resistors and in general one of the most used electronic components. Fixed resistors are available in axial leaded and surface mount packages as well as more customized packages depending on their application. While axial leaded resistors used to be the most used resistors, nowadays the advantages of surface mount devices make the SMD resistors the most popular. A resistor having a fixed, defined electrical resistance which is not adjustable. In an ideal world a perfect resistor would have a constant ohmic resistance under all circumstances. This resistance would be independent of for example frequency, voltage or temperature. In practice no resistor is perfect and all resistors have a certain stray capacitance and inductance, resulting in an impedance value different from the nominal resistance value. The resistor materials have a certain temperature coefficient, resulting in a temperature dependency of the resistor value. 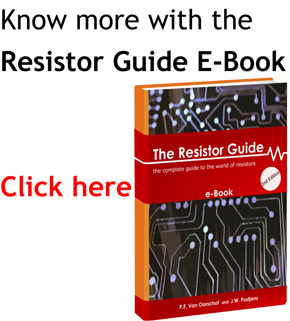 The different resistor types and materials determine the dependency of the resistance value on these external factors. Depending on e.g. the required accuracy, power dissipation and noise requirements, the type and material of resistor are selected. Some common types of fixed resistors are displayed below. For a complete overview of the basic properties and applications of standard resistors, take a look at the article ‘What is a resistor‘. In the following table an overview of general purpose resistors is given. The types listed here are among the most used resistors in general. The carbon film is the most common axial leaded resistor which is used for applications where a very good tolerance and temperature coefficient are not necessary. The metal film is the general axial leaded resistor of choice for higher precision applications. For high power applications wirewound resistors are often used, the aluminium housing as shown in the picture is often used for power ratings from 10-250W. Surface mount or SMD resistors are in general constructed from thick or thin film material. The properties listed in this table indicate common ranges for the values followed by the most common value between brackets. however these values should not be seen as limiting, several special purpose resistors with very different characteristics exist. The following resistor symbols are often used to depict resistors with a fixed value. The most used symbol is the international IEC resistor symbol displayed on the left but the American resistor symbol displayed on the right is also still used.